Do you know where the largest Christmas tree in the world is? In Gubbio, a precious little town in Umbria. This wonderful installation is lit up on December 7 every year, since December 1980, and is turned off during the night of January 10 of the following year. With each passing year the popularity of the event has boomed and reached an increasing resonance, so much that the lighting up ceremony has been carried out with an ever growing presence of people and by celebrities of greater fame at every edition. 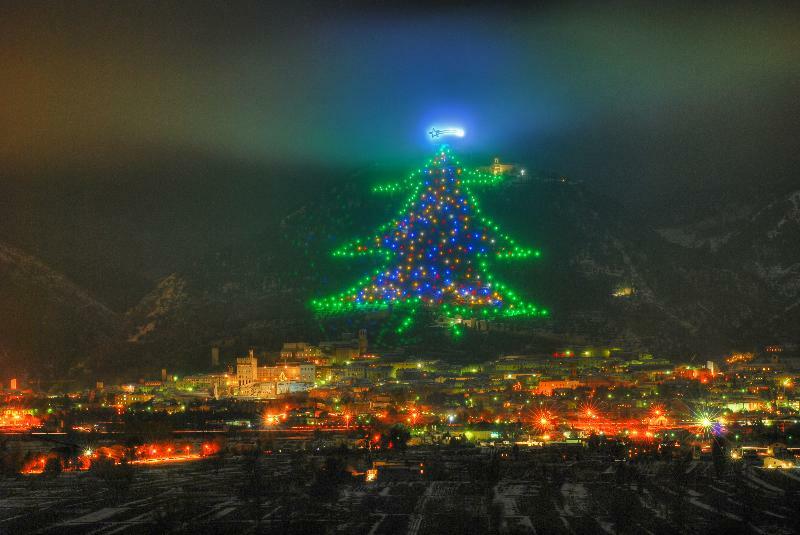 The upcoming edition of the Christmas tree in Gubbio will be lit up by the Pope in Rome! Benedict XVI will use a tablet PC in Vatican City that through an Internet connection will command the switch in Gubbio. The 2011 largest Christmas tree in the world will be lit up at 6,30pm and you will be able to follow the ceremony on RAI 1 (if you have satellite television) or see the images on the webcam of the official event's website. But, wait a minute, who says this is the largest Christmas tree in the world? Well, in 1991 the World Guinness Record committee assigned the title to the installation, making official what the simple people of Gubbio had been saying for many years. 260 lights trace the shape of the Christmas tree. If you decide to spend your Christmas in Umbria, make sure to include Gubbio in your itinerary. It is one of the most delicious towns in Italy, one that will make you fall in love with the region. Plus, it will give you the chance of a unique event and a spectacle of rare beauty to keep in your heart. Come to see the largest Christmas tree in the world. So long for now! To the next time I find something interesting to share about Umbria.